NETWORK FINALS: SUNDAY NIGHT FOOTBALL adjusted to 5.8, down half a point from last week. On ABC, 10 DAYS IN THE VALLEY fell 0.1 in final numbers to an even worse 0.5 premiere. On CBS, 60 MINUTES and NCIS: LA each gained 0.1, but WISDOM OF THE CROWD lost the same. CABLE HIGHLIGHTS: Adult Swim’s RICK & MORTY continued to own Sunday cable, up 0.06 to 1.53, with TIM & ERIC’S BEDTIME STORIES at 0.51, compared to last week’s 0.51/0.48. AMC’s FEAR THE WALKING DEAD climbed 0.13 to 0.88, and TALKING DEAD was up 0.04 to 0.32. On HBO, CURB YOUR ENTHUSIASM returned from several years of hiatus at 0.52, LAST WEEK TONIGHT rose 0.03 to 0.43, VICE PRINCIPALS jumped 0.08 to 0.34, and THE DEUCE was down 0.04 to 0.27. On Starz, OUTLANDER ticked down to 0.33, and SURVIVOR’S REMORSE was up 0.05 to 0.16. On Showtime, RAY DONOVAN rose 0.03 to 0.28, EPISODES ticked up to 0.06, and DICE ticked down to 0.03/137K. TNT’s THE LAST SHIP fell 0.06 to 0.28. Hallmark’s CHESAPEAKE SHORES gained 0.03 to 0.26. The unscripted night was led by the return of E!’s KEEPING UP WITH THE KARDASHIANS at 0.70, with lead-out WAGS at 0.30. 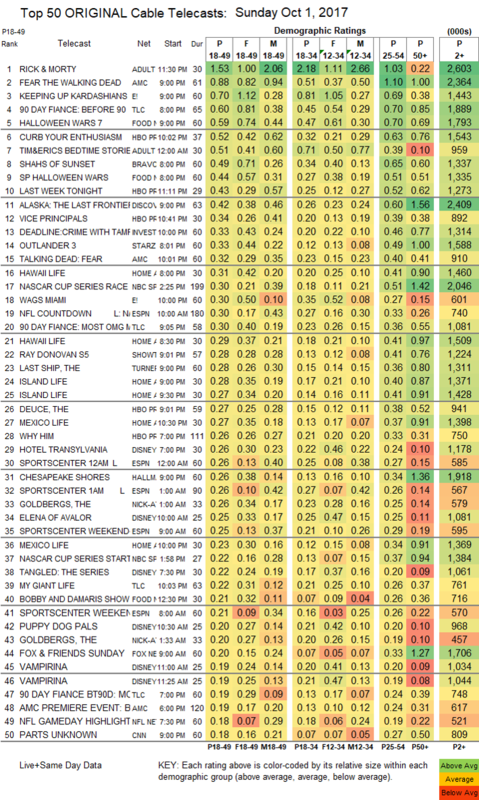 TLC’s 90 DAY FIANCE was at 0.60/0.30, compared to last week’s 0.68/0.53, with lead-out MY GIANT LIFE down 0.05 to 0.22. Food Network’s HALLOWEEN WARS returned at 0.59/0.44. 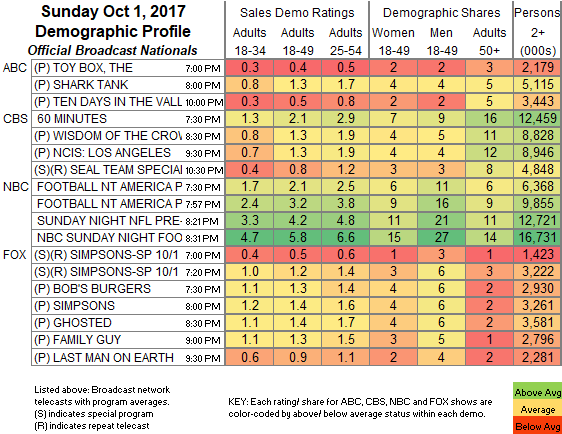 Bravo’s SHAHS OF SUNSET grew by 0.07 to 0.49. Discovery’s ALASKA: THE LAST FRONTIER returned at 0.42.. A DEADLINE show on ID was at 0.33. HGTV’s line-up was led by HAWAII LIFE at 0.31/0.29. NBC Sports Net’s NASCAR race was at 0.30.